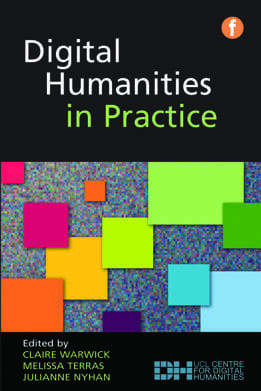 Digital Humanities in Practice, edited by Claire Warwick, Melissa Terras, and Julianne Nyhan, is a cutting-edge and comprehensive introduction to the scope of the discipline and provides a wide-ranging insight into emerging topics and avenues of research. Published in November 2011, chapter summaries and case studies are available for each chapter. The book discusses work that is being carried out at, or that involves members of the UCL Centre for Digital Humanities. We also blog about our work and tweet at @ucldh. If you would like to buy the book, you can do so from the Facet publishing website.